Just short of a year ago, General Motors garnered widespread national attention by announcing it planned to start testing autonomous cars on the busy streets of Manhattan in “early 2018.” But the automaker’s pilot has yet to launch, and no one is willing to publicly offer a detailed explanation for the delay. What happened? Did it get eaten by bureaucracy, or caught up in the war between New York City’s mayor and the state’s governor? In May, GM Cruise—the automaker’s self-driving subsidiary—confirmed that it had yet to receive a permit to begin testing, telling Jalopnik that while it has mapped a “significant portion of NYC,” the city is a “complex regulatory environment and we continue to work with stakeholders on next steps.” Yet communications between GM and the state agency that oversees the autonomous vehicle permit process appear nonexistent as well. The delay underscores the difficulties that companies like Google’s self-driving car unit Waymo and GM will face in the coming years to expand the presence of driverless cars across the U.S. GM is one of a significant group of companies working to commercialize self-driving car tech, but until now, the technology has only been deployed in states with relatively easy terrains for the still fledgling technology and a welcoming environment. To figure out what GM is working on with with the necessary stakeholders in New York, Jalopnik filed a public records request with the state’s Department of Motor Vehicles, which oversees the permitting process for autonomous vehicle testing in the state. But in a response dated Sept. 4, the DMV offered up a curious response, given its key role in the process: it has no record of any communications from GM on its effort to secure a permit. “After a diligent search, the Department is not in possession of any records responsive to your request,” the letter stated. Lisa Koumjian, a spokesperson for the DMV, didn’t comment on why the agency has no apparent internal record of discussions with GM, when reached by Jalopnik on Monday, but said in an email that: “The application and planning process are ongoing.” A GM Cruise spokesperson, when reached by Jalopnik, reiterated the statement offered for a previous story on plans for Manhattan tests. But Tech:NYC didn’t want to discuss the holdup, either. “We really appreciate you reaching out, but will respectfully decline to comment right now,” Tech:NYC spokesperson Will Chabot told Jalopnik. GM’s statement about a “complex regulatory environment” leaves open the possibility that it’s having to navigate the very obvious political maelstrom that exists between New York Governor Andrew Cuomo and New York City Mayor Bill de Blasio. When the project was announced last October, Cuomo’s office offered up the prospect of autonomous vehicle tests in Manhattan with a splashy statement, saying GM Cruise’s effort could happen only thanks to legislation he’d signed. 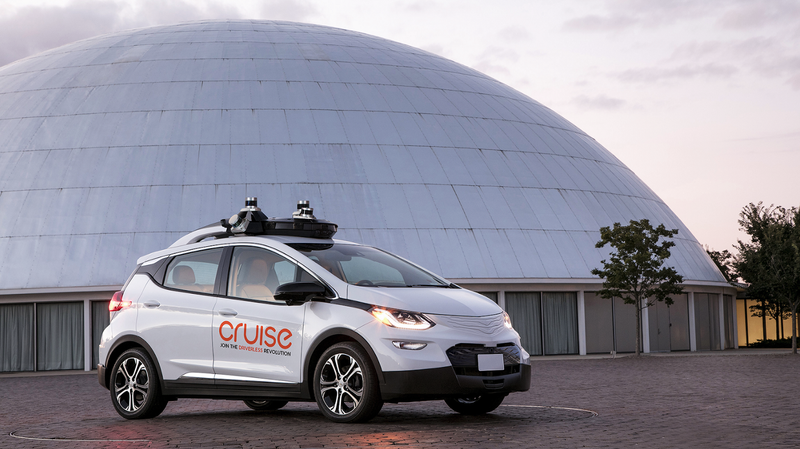 “Autonomous vehicles have the potential to save time and save lives, and we are proud to be working with GM and Cruise on the future of this exciting new technology,” Cuomo said in a statement at the time. There was one hiccup: Cuomo’s office hadn’t consulted with de Blasio, which annoyed the mayor’s team, as the autonomous vehicle tests would be conducted on city-patrolled streets. A spokesperson for the mayor reiterated de Blasio’s concerns in a statement to Jalopnik on Monday. A spokesperson for Cuomo, who’s currently embroiled in a heated primary election bid, didn’t respond to a request for comment on the delay in the timeline his office sketched out for GM’s tests to begin. GM has outlined an ambitious plan to launch driverless cars across the U.S., having introduced an all-electric Bolt without a steering wheel or brakes earlier this year. The company also has engaged officials in San Francisco about launching a driverless pilot project in the near-future, according to emails obtained by Jalopnik. GM has been actively testing self-driving cars in the California city, and has made it well-known it’s looking to deploy cars without a driver for a to-be-determined commercial service. Despite the holdup in New York, GM Cruise claims it still has intentions of launching in Manhattan. The company’s careers page lists a section for open jobs in NYC, however there’s zero currently posted. GM Cruise is also leasing space previously occupied by the Classic Car Club Manhattan in a building located in the city’s Tribeca district. It’s clear the company has ongoing activity in the space. During a recent visit by Jalopnik, a security guard at the building’s front desk directed a reporter asking for “Cruise Automation” to a first floor corner space that’s only accessible through a dedicated door at the corner of the property. Jalopnik asked a worker employed by one of the building’s other tenants who was on a smoke break outside about the space. The employee said they caught a glimpse inside the space one day when the garage to the former Classic Car Club was opened, and they saw several unspecified cars and some workers milling about. The worker added that a security guard is typically seen standing outside the main door to GM Cruise’s space. The door was locked. Know anything about GM Cruise and its effort to test autonomous cars in NYC? Drop us a line.